Fox is broadcasting a 30-minute animated Red Dead Redemption film this weekend, a prequel to the videogame that launches the tale of reformed outlaw John Marston. 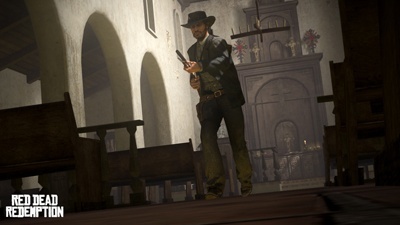 Set in 1910, the Fox special Red Dead Redemption follows the early days of Marston's pursuit of his former comrade Bill Williamson and his first encounters with his new traveling companions, including a "violent sheriff and a colorful, mentally deranged grave robber." They track Williamson to an abandoned fort, where their plan to capture him leads to a "dark, surprising twist." The film was directed by John Hillcoat, who's probably best known for directing the 2009 Viggo Mortensen flick The Road but also brings legitimate Western cred to the party as the director of the 2005 Australian film The Proposition, a very Red Dead-sounding affair in which a captured outlaw is given nine days to track and kill his older brother, or his beloved younger brother will be hanged. Great. Now I've got two Westerns to watch. The Red Dead Redemption animated film will air at midnight ET/PT on May 29 and viewer discretion, as you may have guessed, is advised.